Living in Maine, and now in Alaska, our family is no stranger to “inside play days.” Like the image from The Cat in the Hat, my two young children gaze out the window at the rain, sleet, or snow falling down and know that unless the weather changes abruptly, we’re staying in. Thankfully, I have a few pre-planned go-to activities for such a day – and today, I’d like to share them with you! 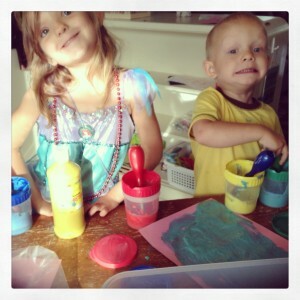 Kids love to get messy, and they love to create. Getting crafty with my kids is my first major go-to activity for inside play. Whether it’s painting, scissor practice, play dough, or perler beads, crafts are a great way to spend some time and keep your children imaginatively occupied on an inside play day. And if you’re stuck inside today and can’t go out to get craft supplies . . . never fear. Did you know that paint is super easy to make? Play dough, too. You probably have the ingredients in your cupboard right now. Crafts do not have to be elaborate, and there’s no need to strive for perfection. So, mark this one down in your rainy-day plans: getting crafty can keep kids very happy on an inside play day. Check out the Natural Parents Network DIY Arts and Crafts Pinterest Board for more great ideas! Also known as baking, kitchen chemistry is a favorite in our house for inside play. 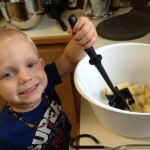 Kids of all ages can do age-appropriate tasks, like stirring, pouring, rolling, or using cookie or biscuit cutters. 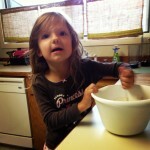 As they grow older, kneading, cutting, and measuring can become favorite kitchen tasks. It’s important to me to teach my children how foods are made, and that yummy snacks, meals, and treats are made of raw ingredients, time, and labor. Granola Bars, Muffins, Pancakes, and Bread are fantastic (and relatively easy) recipes to get your family active in the kitchen. My kids especially love bread recipes, because the rising dough is magical for them. They love being hands-on with dough! Kitchen chemistry (aka baking) is a great way to introduce children to the labor that goes into preparing meals, treats, and snacks, and also to inspire a love for foods that do not come in a package. And it’s a perfect “inside play day” activity! We are lucky to have an open basement area that doubles as laundry/storage and a play area for the kids. But physical activity can happen inside our living quarters too, on a cold, rainy, or snowy day. Our favorite physical activities for indoors are dancing, hide and seek, and follow the leader/obstacle courses. Sometimes, we’ll even hold races to see who can put away their folded laundry the fastest, and not only does that get our heart rates up, but it also accomplishes a chore! When you’re stuck inside, getting creative with physical play is a great way to nurture adaptability and creativity. Whether you’re having a dance party, just playing pretend, or seeing who can complete physical tasks in an indoor competition – don’t be discouraged from getting active if you’re stuck indoors. I have found that it is generally a good idea to actually participate in the physical play as parents. Not only are the children more excited and interested when mommy and daddy play, but we reap benefits from the physicality, too. Especially on dark winter days, the exercise – even if it is a small amount- has a way off fending off the blues. Necessity has been the mother of invention in our few years of adapting to new climates in our military family journey from one place to another. I hope that these suggestions can inspire you to be creative in fostering a sense of wonder in your family around “indoor play day” fun! What things does your family enjoy doing when you can’t play outside?